It’s asparagus season here! And while my baby asparagus patch has some shoots showing, I’m waiting until next year to start harvesting. 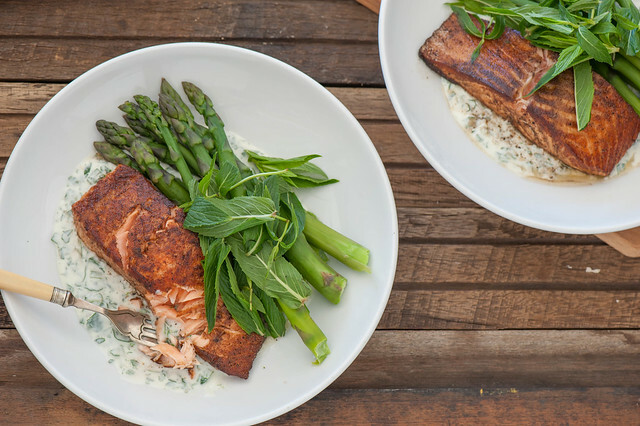 Of course, you don’t need to wait until spring to enjoy this crispy spiced salmon with its cooling herby yoghurt. Just substitute in green beans, snow peas or skip the green veg and just serve it all with some cauliflower ‘rice’. 1. Bring some water (about 2cm / 1in) deep to the boil in a frying pan. Trim asparagus / beans and simmer for 2 minutes or until tender. Drain and discard cooking water. 2. Combine 2 tablespoons oil with the garam masala and a good pinch of salt to make a spicy oil. Pat salmon dry with paper towel and toss in the oil to coat. 3. Return the frying pan to a medium high heat. Cook salmon for 3-4 minutes on each side or until cooked to your liking (I like it still quite pink in the middle and crispy on the outside). 4. While the salmon is cooking finely chop most of the mint, saving some whole leaves to garnish. Stir the chopped mint into the yoghurt with some salt and pepper. 5. To serve, spread minty yoghurt on two dinner plates. Top with salmon, asparagus / beans and reserved mint leaves. different veg – snow peas, sugar snap peas or even regular frozen peas would all be lovely. Or just use a few handfuls baby spinach instead. In the cooler months some wilted kale, spinach or other greens are a great choice. Grilled summer veg like eggplant, zucchini and bell peppers (capsicum) will also be fab. different spice – curry powder would work instead of garam masala or just use 1 teaspoon each ground cumin, coriander and smoked paprika. vegetarian – serve cooked lentils, spiced with some garam masala with the asparagus and minty yoghurt. carnivore – use lamb or pork chops instead of the salmon. different fish – feel free to use any fish fillets. carb-lovers – serve with steamed rice or warm chappatis or other flat bread. more substantial – serve with a generous handful roast cashews or almonds. Or use larger pieces salmon. Or replace some of all of the yoghurt with mayonnaise. dairy-free – use coconut yoghurt or replace youhurt with hummus. Or make a minty oil by stirring chopped mint into a few tablespoons extra virgin olive oil. different herbs – use coriander (cilantro) basil or flat leaf parsley or a combo of any of these.